Gin is a pretty divisive spirit. Ask your friends if they like whiskey, you’ll get a few mild shrugs, a couple unasked-for Pappy tattoo reveals, and a bunch of “Oh yeah, sure,” because we’re all supposed to like whiskey. Ask your friends if they like gin, the room will erupt into chaos (or fall entirely silent, while maybe one guy shyly raises his hand). This isn’t because gin is a terrifying spirit. Sure, it’s the only spirit with the must-have piney notes of juniper, but since when did something tasting like a pine tree stop people from drinking? (We’re looking at you, hop-heads.) In truth, gin isn’t just juniper, and that’s just the tip of the iceberg of what we don’t know about it. To correct that, 11 facts about gin that might reintroduce you to a spirit worth knowing. Gin as we know it has its roots in war. The Eighty Years War, to be exact, where British troops witnessed Dutch soldiers knocking back genever—a more malt-forward juniper-flavored spirit—and were reasonably intrigued. This is also where the term “Dutch Courage” comes from. Gin also has roots in the pharmacy counter. Gin comes from genever, which 16th Century Dutch pharmacists actually prescribed medicinally. (Remember, Walgreens was basically built on whiskey prescriptions.) Genever was pretty harsh back then, so it was dosed with juniper berries, kind of like making medicine taste like bubble gum. And yes, for people who hate the taste of juniper, this might seem like an insane choice. But it worked. The Brits loved Gin wayyyy too much at one time. The breakup of the London Guild of Distillers, not to mention a mild tiff with France (and its delicious brandy) led to the British government actually encouraging gin production. Except citizens loved it a bit too much (reference: the famous “Gin Lane” painting—and yes, that is a mother dropping her baby, among other debaucherous happenings). 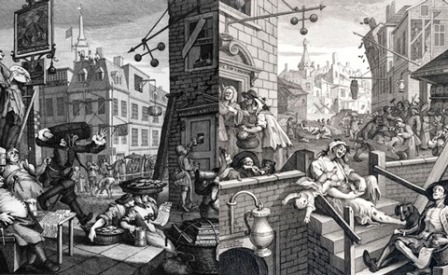 By the early 18th Century, gin was already being decried as the downfall of civilization as we know it. There was (maybe) a secret gin vending machine. Gin is not one-note juniper. Yes juniper must be the prominent flavor in every gin (per the Alcohol Tax and Trade Bureau: “It shall derive its main characteristic flavor from juniper berries and be bottled at no less than 80 proof.” But gin producers can—and do—add a variety of other flavoring agents to achieve a more complex, and entirely unique, flavor profile. Anything from citrus peel to botanicals (florals, herbs) to spices and roots might differentiate one gin from the next. Gin is vodka. Sort of. Gin might have a ton more flavor, but that flavor is actually infused into what is essentially a totally neutral spirit: vodka. And the infusion of juniper and various botanicals might be done in a few different ways (the best being re-distilling the gin with the botanicals). But if you were to interrupt the process at a certain point, before the flavoring of the spirit, you’d end up bottling vodka. Not gin. Gin can be sweet or dry. “London Dry” gin is probably the most popular variant. It’s dry, as in not sweet (though it doesn’t have to be produced in London—that’s just the style). Plymouth gin, on the other hand, can only be made in Plymouth, England, and tends to be a bit earthier. Old Tom Gin is a tad sweeter, bridging the gap between gin and genever. And Navy Strength gin is all about high ABV — high enough that gunpowder doused with it would still ignite, or so the story goes – 57% alcohol to be exact. The origin of the Gin and Tonic, beloved anti-malarial cocktail, actually began with the tonic. British soldiers stationed in India had to take quinine, derived from cinchona bark. To mask the powerful flavor of the quinine, they’d add gin, lime juice, and sugar. Bathtub gin was a thing. And it was terrible. As we all know, Prohibition didn’t quite lead to nationwide temperance. It mostly led to clever ways of getting booze secretly (see: Gin Vending Machine above). During the 1920s, people actually made “gin” in bathtubs, though it was often an incredibly harsh—and often toxic—variant, derived from things like wood alcohol. The stuff was heavily flavored to mask its potential deadliness. Brits love gin. But Filipinos love it more. The English might have started the gin market, but the Philippines owns it. Kind of literally, accounting for close to half of global gin consumption—a lot of it domestically produced by gin megalith Ginebra San Miguel. And in case you’re wondering, gin came to the Philippines by way of Spain, where the gin and tonic is a favorite cocktail to this day. Gin is an ideal cocktail spirit.